What is it like to live near fracking? Six photographers spent two years in gas-rich Pennsylvania trying to find out. These pictures show people living with fracking. Fracking pumps water and chemicals under the ground at high pressure. This breaks up rocks and forces out the natural gas. They say gas from fracking is cheap energy. But it is a fossil fuel and when we burn it, it changes the climate - like coal, oil, and other gas. And what does it do to people’s lives? In the US, it seems to pollute drinking water and the air. In Britain, many communities are protesting against plans to have fracking near their houses. These pictures show that things are worse in America than in Britain. Fracking is already there. These photographs show how this happened and the human and environmental effects. They show the winners and losers from fracking – for example, some people made money from selling land and some people had to move away. The photographs tell the true story. Bob Miller. 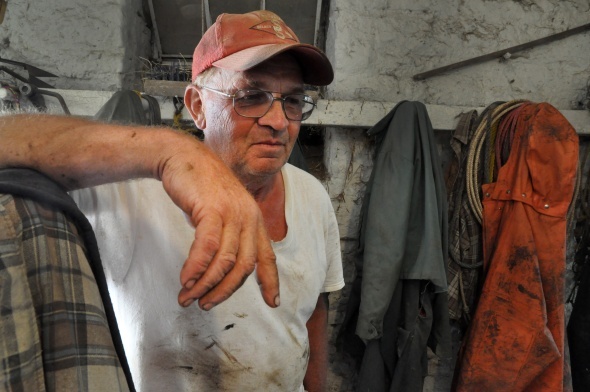 The Millers leased their land for gas drilling and made enough money keep their Meadow Creek Farm running. Janet McIntyre (left) meets Emily Collins of the University of Pittsburgh Environmental Law Clinic. This is part of an investigation into Janet’s situation. Reverend Leah Schade is a Lutheran Minister and an environmental activist. 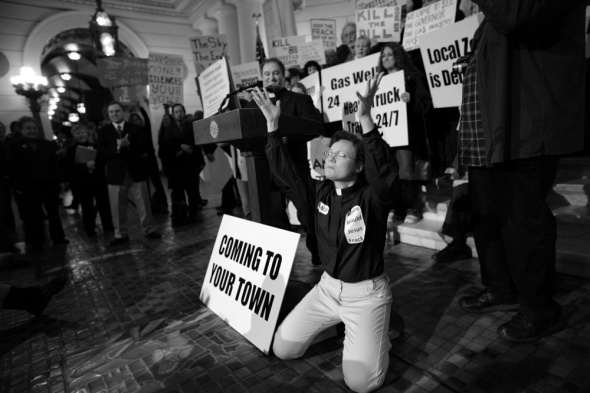 Here in the Pennsylvania state capitol, he prays for something good from the fight against fracking. 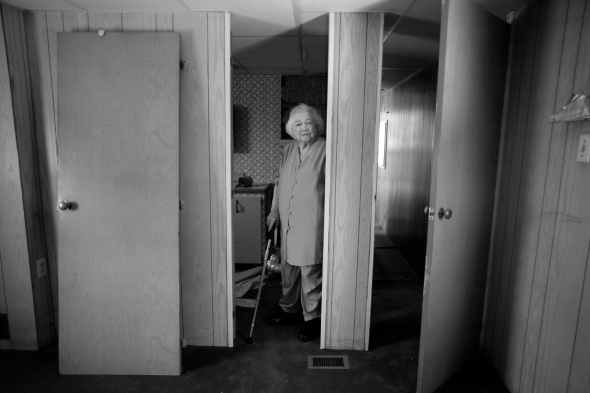 Betty Whyte in her empty mobile home in Riverdale Trailer Park. The land under the Park was sold to Aqua America for a water extraction plant for fracking. Many people here were elderly and living on very little money. They had to move suddenly, with only $1,200 to $2,500 to help them. Betty and her husband, Bill, have been married for 51 years. This was their home. Matt Walker is from the Clean Air Council and Ralph Kisburg is from the Responsible Drilling Alliance. 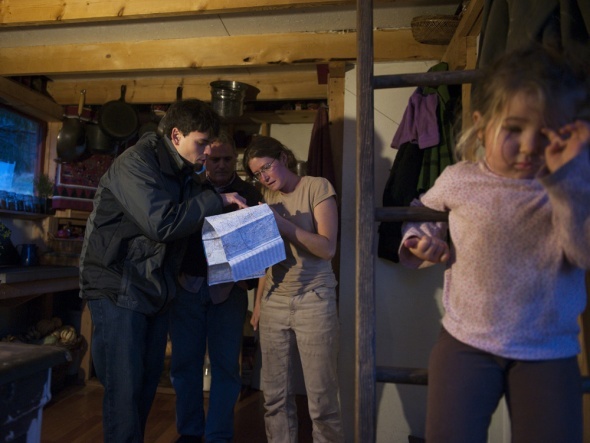 They visit the one-room home of organic farmers Adron and Mary Delarosa. They tell them about a meeting about a compressor station planned near their home. Because of the station and the four wells planned one mile from their home, they are worried about their daughter’s health. Springville, Susquehanna County. Fred McIntyre at his home in Connoquenessing Township, Pennsylvania. 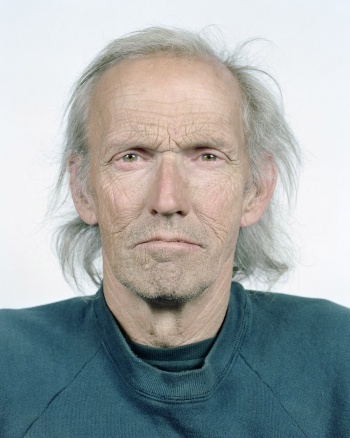 He has lived in his home for 20 years. After the gas drilling started, he drinks only bottled water. Lee Zavislak of Amity, Pennsylvania, in a truck-driving class at the Western Area Career & Technology School in Canonsburg. The school is helping gas companies train truck drivers. Lee said she would not drive for the gas companies because of the environmental damage they are doing. Bob Casey called a meeting in Pittsburgh, Pennysylvanis, to discuss action plans for accidents from gas drillers. Stephanie Hallowich is a landowner in a protest with a gas company. 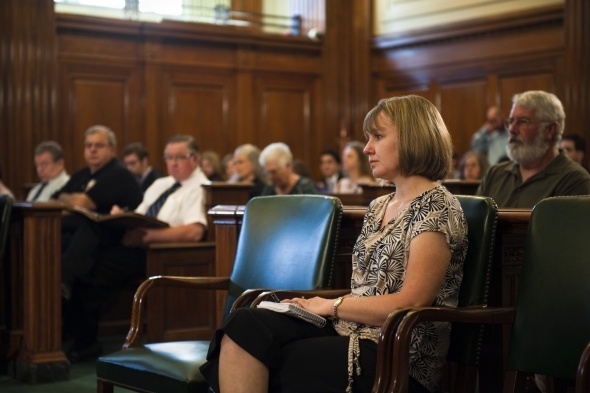 She is crying as she listens to a person with very bad health problems. People think her health problems are from water and air pollution from fracking. NOW READ THE ORIGINAL:http://newint.org/features/web-exclusive/2015/02/04/living-with-fracking/ (This article has been simplified so the words, text structure and quotes may have been changed). This page was last edited on 7 February 2015, at 19:57.